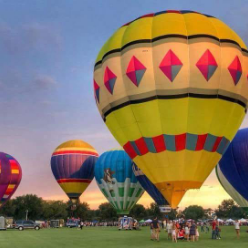 Hot air balloons will glow each evening at dusk, with tethered hot air balloon rides available! Featuring the best food trucks, retail vendors and activities for the whole family. Location TBA (see website for updates). Hot air balloons will glow each evening at dusk, with tethered hot air balloon rides available! Featuring the best food trucks, retail vendors and activities for the whole family. Location TBA (see website for updates).